The weekend after Thanksgiving is usually avoided by Hollywood like it does original ideas. However, a crowded December has driven two films with reasonably high hopes, one of which has high Academy Award hopes. If these films can find box office gold despite the one-week blah that normally hits at this time, they may break one more stigma-laden period open. The Last Samurai is the obvious contender to achieve this feat, being the season's Big Tom Cruise Movie (I was expecting the de rigueur Vanity Fair cover spread but apparently even they've had enough of him). 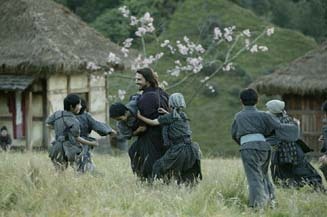 Samurai has Cruise playing a disillusioned Civil War commander hired by the Japanese to help modernize their army. Captured by a band of samurai, Cruise's character adopts their ways and learns about honor and courage and all those other abstract nouns related to warriors. In a nearly unavoidable comparison to Dances With Wolves, he finds himself fighting against the very army he once was a part of. Cruise remains pretty much bulletproof when he's the headliner; even Vanilla Sky, viewed by many as a confusing disappointment, opened to $25 million and broke the $100 million mark. Minority Report brought in $135 million last summer, which many saw as a bit of underachieving for a film with both Cruise's and Steven Spielberg's name attached. As opposed to showing that his appeal is waning, though, these numbers reinforce that Cruise is still at the top of his game for being a box office draw. These two films are regarded as his disappointments yet still earned $237 million combined. What a burden to have this be your mark of disappointment. This is a relatively safe outing for Cruise, allowing him to extend his dramatic chops but still giving the audience the benefit of exciting action scenes (with one reportedly nearly taking his head clean off -- he seems to have these stories come out with every one of his films). Director Edward Zwick is familiar with the period and its battles, having directed 1989's Glory but is usually nothing more than "competent," with films like Legends of the Fall (how it pains me to include this melodramatic tripe among the competent, but I digress) and The Siege neither embarrassing nor shedding congratulatory light on him. The National Board of Review is first off the block in awarding its Director prize to Zwick, which is something of a surprise (though they are often willing to go for oddball choices that don't get recognized in later awards). It's just a bit too obviously formulaic to be a gigantic hit, though it should be reasonably satisfying in the Tom Cruise genre. Debuting at 2,908 venues, Samurai should break the doldrums of the first week of December to the tune of $32 million. Speaking of formula, Honey is about the 5,634th version of the plucky youngster believing in themselves and proving their talent through the power of devotion, this time set in the world of R&B choreography and starring Jessica Alba's midriff. We've seen this done in many ways recently and you really have your pick of comparison films; for me, it flips between (the certainly very different) 8 Mile, Coyote Ugly, Drumline or (in my crueler moments) Glitter. Sadly, I don't think that latter comparison is too far off though Honey, doesn't share Mariah Carey's Earth-swallowing ego and claims of autobiography. This is Jessica Alba's midriff's first top-billing so there is little to judge against for her box office draw; there is certainly the following from Dark Angel, the short-lived but cult-favorite TV series, but the chances of those fans following into something completely unrelated seems low. Hence, to give this film some credibility, the rap stars that all the youngsters like have been added to the cast. These include Lil' Romeo (he's no Young MC) and Missy Elliott (whose role I have to think is not much more than a cameo). Mekhi Phifer is also on hand as a basketball-playing love interest and makes it at least a little interesting, but this is about as close as you can get to a product without slapping a brand name on it. Set in the world of music videos and helmed by a music video director, this film's going to be about as impacting as one of those short-form pieces. I'll be generous and give it a starting weekend of $6 million, but this is very much a wait-for-DVD film, if even that. After an inauspicious start relative to expectations, The Cat in the Hat had an even less promising second weekend, falling almost 40% on a weekend where many others took advantage of the holiday to drop 20% or less, or in the case of Elf, improve their takes. Clearly, the Mike Myers rendition of the red and white striped-hatted feline did not capture our imaginations, or perhaps more accurately, couldn't compete with them. Weekend number three will continue the trend, as the film should fall over 50%, dropping to about $10 million after two weeks at number one. The Haunted Mansion and Elf will be left to battle for family dollars, with Elf already appearing to be the victor, pushing ahead in weekday totals. It was only slightly behind the 1-2 finish of Mansion and Cat in the Hat and was the only film in the top ten to increase its take, and did so by a significant margin. That's a fluke of the calendar, though, and it will start its decline again, until its third wind at Christmas. Look for $15 million and a near approach to $150 million total by Sunday. The Haunted Mansion threw a dart square in the middle of Eddie Murphy's recent family film performances and despite (or maybe because) of its generic nature, should be a decent performer through December. Around $13 million is to be expected here for week two, on its steady march to the low hundreds of millions. The real surprise of the Thanksgiving weekend was the performance of Bad Santa, which despite a potentially alienating subject, drew in $12 million over three days and $16.8 million over five. And, not content for mere one weekend shock value, it's actually moved all the way to number one in the weekday figures, with the family films suffering a traditional letdown in this period. It warms the heart to see so many embracing this unsentimental black comedy. Add another $7 million to Bad Santa's sleigh this frame. The Missing may have effectively performed its way out of Oscar contention with a very mediocre $10 million start; Cate Blanchett and Tommy Lee Jones proved to be not enough of an enticement for the mystical-flavored Western. Once again we wait for films to step up and claim their place in the contender ranks. Timeline was never going to contend but fared even more poorly, finishing fourth of four new releases. Michael Crichton novels truly are dead as a genre, as there wasn't even a manufactured vitriol against this one, merely indifference. No new limited films brave the weekend but two notable events occur; the sneak of Something's Gotta Give, the Jack Nicholson/Diane Keaton/Keanu Reeves, "May, no December, wait May, uh... December/December" romantic comedy, which is positioning itself as the feel-good Oscar contender, and the re-release of The Lord of the Rings: The Fellowship of the Rings in a hundred or so theaters in advance of the completion of the trilogy of films.